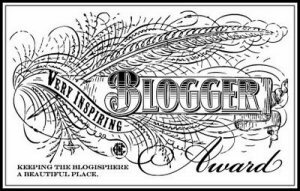 Dear Friends, I have the honor to tell You that My blog is nominated and awarded as a “Very Inspiring Blogger”. This is one of the wide spread virtual awards in the West. Dear Friends, this is my second foreign award which I have the honor to receive. I would like to to express my great appreciation to the blog “The World of Alexander The Great” for nominating me for this Award! Thank You so much! I deeply appreciate that. I am very glad to deserve this award from Maarit-Johanna, the owner and founder of the blog “The World of Alexander The Great”. She has a very beautiful, useful, informative and interesting blog and I am very glad and proud to introduce Her blog to all my Armenian readers as well as to dear followers from abroad. 1. Link back to the person who nominated you: Thank you again dear Maarit-Johanna for nominating my blog for this award. I really appreciate for your support! 2. Post the award image to your page. 1. I have started to write my new book. 2. I love people with good sense of humour. 3. Years ago I was fond of playing the piano. 4. I would like to visit these countries: Mexico, Brazil, Argentina, Spain, France, UK, Italy, Iran, Kazakhstan, India, China and Japan. 5. I want to learn Spanish language. 6. I can watch my beloved films again and again. 4. Nominate 15 other blogs and inform them about that. Once again thanks much dear “The World of Alexander The Great”. Dear Friends, I would like to say that it would be my pleasure to nominate much more bloggers, but unfortunately I have to nominate only 15 of them according to the rules of the award. Anyway I appreciate and follow also all those bloggers, who are not in this list below. They would be certainly nomitated by me in my next award which I hope to receive in future. By Arlen Shahverdyan in Տարբեր / Various, Այլ կայքեր / Other websites on August 4, 2012 . Thank you very much!! Appreciated! Khndrem 🙂 You are welcome! I hope you’ll accept the award. Sure! Do i have to something? Do you have what? If you accept, you are free to create your own post according to the rules ofthe award. See the rules in my post. I meant am I suppose to click on something? You also deserve it Alana and it is my pleasure to nimonate you. Just follow the rules and write a post about the award. And… ENJOY!!! You are awarded!! 🙂 You have a very useful and interesting blog! Aww such kind words – I appreciate your taking the time and that you enjoy my blog as I do yours. Your love for animals is so touching, and your poetry is exceptionally good ;)) You are very talented. Talk soon.. Thank you very much Alana. I have the honor to receive such kind of friendly and warm comment from you. Congratulations, Arlen! You have received a well deserved award! Dear Stefania, thank you very much! Your blog is wonderful and I want to ask you something. If you do not mind then put the widget of E-mail subscribtion for me and for all the readers to me able to subscribe your amazing blog! Thank you so much for your appreciation, dear Arlen. A widget to apply e-mail for you! Thank you again for your beautiful words. Arlen, I’m so sorry and I ask thousands of excuses, but I could not post wiget e-mail to subscribe. I don’t found in my menu. I’m so sorry because of that. I do not know what I can do. I am researching and hope to eventually succeed. You have to ask an expert. I thank you all for your understanding. You are always welcome with love on my blog! Once again thank you so much for your appreciation! Dear Stefania, as you can’t find the necessary widget I’ll did another think, I’ll start to follow you in my reader, another tool of wordpress and I hope that I’ll receive your posts. To be honets I love your blog very much, it inspires me a lot. That’s why I wanted to subscribe. Everything is OK, don’t worry. Thank you so much, Arlen, for understanding. I will still try. Must eventually fail. But right now even I could not. I do not know what I can do and this saddens me. All the best for you and for your family! Thank you very much! Appreciated. Try to find the tool, every wordpress theme has this tool, it is one of the necessary tolls of each theme. Thank you Arlen. I have replied to you on my post, but I wanted you to see further explanations on my page, and hopefully you will understand my motives. I know your intentions are genuine, as I can see it through your writing that you are honest, well-meaning and genuine, but I don’t like very much the concept of this award thing. There is a better way to let others know about bloggers worth visiting, and I make sure to add blogs I admire in a special place on my blog with links to their pages. Here are the posts where I mentioned my reasons for declining the awards: here, here and here. Dear Paula, everything is OK 🙂 I understand and respect your decision. It’s your choice, your point of view, your blog. That’s why you are free to continue blogging as you wish. I nominated your blog because I think you deserve it. I am not offended with your declination. Paula, I continue to visit, read and follow your blog with great interest and pleasure. 😀 🙂 Have a great Sunday! I will be back to check on your page soon. Congratulations and thank you for nominating us! Thank you very much! I nominated you with great pleasure! Hope you’ll accept it. Thanks Alana, even if you are new around here your blog deserve the best award, it is honest, very Armenian and at the same time very cosmopolitan. Stay Armenian and be proud of it. I see that you are very proud of it. It was my pleasure to discover 🙂 your blog. Thank you very much dear Alana! It is my pleasure to receive such words from you. Arlen jan! Congratulations! You deserve this award fully. Your blog is completely inspirational. And what can I say – I’m very humbled you nominated me. You are welcome Manisha. I am sure you deserve this nomination. Thank you for your kind words. Thank you also for following me on my FaceBook page. Wish you the best in your life: personal and working spheres. You are a very good person and I am sure you will succeed in everything. Thank you for your very sweet words Arlen. I’m very very humbled. You are too kind. I wish you success in all your future endeavours and I’m sure that with your passion and intelligence you will make it big one day :). By the way, to accept this award am I supposed to create a post like this one? Thank you Manisha for your kind words. You are very tender and kind person too. Wish you the best in your future endevors. I am sure you will succeed in everything. Manisha jan, yes you are supposed to create a post like this to accept the award. You are too kind Arlen jan :). Congrats Arlen and how exciting to be writing your book! Dear Tj, it is my gret pleasure to read words from you. Thank you so much, appreciated!!!! Thank you soooooooooooooooooooooooo much!!! 🙂 I welcome you dear Shiro and your wonderful and exciting blog!!! Dear Arlen, thank you so much for your kind words. I really appreciate it. Have a beautiful Sunday! Dear Maarit-Johanna, I would like to express once again my deep appreciation to your support and friendship. Thanks much!!! I am glad to have a friend like you! You truly deserve the award and I will be glad if you creat the post and accept the award. I have just discovered your blog! ^^Congratulations! I love that you have a WWF emblem. I’ve been donating to that organization for many, many years. Thanks for the idea–never occurred to me to have their image on my site. I have a special permission from WWF Armenian Branch to have WWF image (logo) on my site. Besides, WWF Armenian sponsored my book “Right to Live”. Thats why I express my appreciation to WWF Armenia introducing their activity in my blog. CONGRATULATIONS! Thanks for visiting my blog. Thank you very much! You hava a unique and nice blog. I would like to tell you that I have shared one of your posts with my Facebook Friends. An amazing post! 🙂 Thanks for sharing! I am honored! Thank you for sharing! The same to You! Thanks again! I started to follow Your nice blog! WELCOME! Thank you for subscribing to follow my blog. I hope you are encouraged, inspired and enjoy the photos I take concerning life and events as seen through the lens of my camera. BE ENCOURAGED! BE BLESSED! Thank You too! I enjoyed the posts in your blog. Wish you the best in Your future endeavours! Today I opened for almost all the Posts of Your Blog. They are unique, interesting, colourful. Thank You again for Your attention and the time You spend on My Blog. Deeply appreciated! It is my pleasure! Thank you too for watching my Posts and for your good thoughts! Today I spent a part of my time watching beautiful photos and reading very interesting articles on your blog, it was a great experience :). Thanks for sharing your ideas and your photos! Thank You again, Cristina. I appreciate Your kind words. In Armenia is now 00:45 🙂 Have a good night too! I wish You all the best in Your life, in Your personal life and in Your work. I am sure You’ll succeed in everything You do. Wish you the best too in everything! It is my pleasure, thank you too for watching my blog and for your good words! Today I spent a part of my time watching beautiful photos and reading interesting articles on your blog, it was a great experience! Thanks for sharing your ideas, your poems, your photos, your drawning and your articles, it’s a very good thing! In Romania it’s 23.46 o’clock, I suppose in Armenia it is very late so I wish you good night! It was very nice to meet you! It was nice to meet You too! Once again thank You for the time You spent on my blog. Much appreciated! Thank you very much, Anne Elizabeth! Appreciated! Thank You very much! Your blog is unique and nice too! and I follow it with pleasure!